Giza 93 is a promising cross between Giza 77 (the same source of Giza 87) and Pima S6. Proudly obtained by Egyptian researchers of the Agricultural Ministry, and commercially introduced in 2013, it is the latest result of years of research and devotion, about Extra Fine & Extra Long Staple category, presenting the highest level of quality just like Giza 45 in fiber properties, spinning potential and spinning performance. The fibers of Giza 93 are extremely long (37 mm) compared with the other ELS Cotton varieties. It has a uniformity index of 89.9% and the fineness of its fibers measures in micronaire around 2.9. The stretching resistance of Giza 93 fibers is the highest in the world, with an average of 48.3 g/tex. 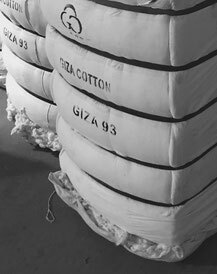 Because of its fibers fineness and strength, the use of this Giza Cotton variety, shows an extreme softness quality with very high durability.